The abstract should be sent electronically in English language only and be formed according to the given template. 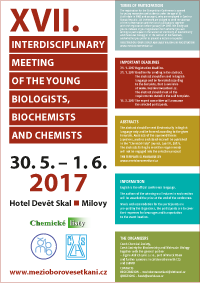 Abstracts of the approved theses (speakers, posters and stand-ins) will be published in the "Chemické listy" journal, (part V, 2017). The abstracts failing to meet the requirements will not be engaged into the selection process!